Within the Marine Corps the “Old Breed” has a special meaning, referring to the soldiers of the 1st Marine Division and their heroic defense of Guadalcanal in the early days of World War II, as well as to those who have gone before. This book gives today’s readers a rare chance to hear these old soldiers tell their own stories and to learn firsthand what it was like to be there for some of the twentieth century’s most harrowing battles and powerful triumphs. 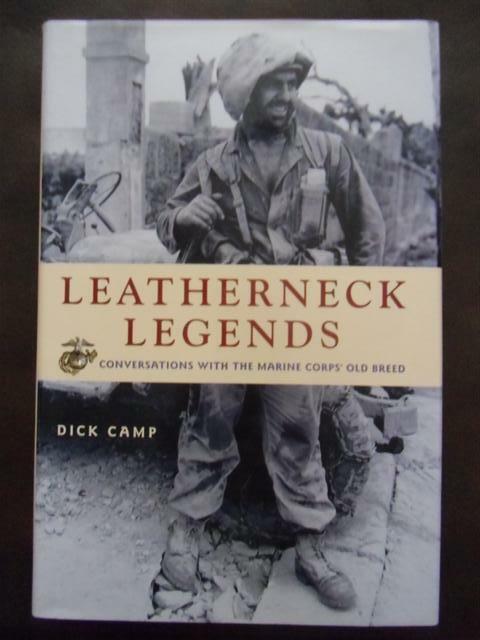 From personal interviews and the archives of oral history, the author has collected the reminiscences of the Marine Corps’ top rank of post-World War II officer legends, from early fifties commandant Lemuel Shepherd’s memories of Belleau Wood in World War I to on-the-spot accounts of leading soldiers into battle in Vietnam. Many of Camp’s subjects were commandant of the Corps, most were four-star generals, and all were heroes whose stories are the stuff of history. Leatherneck Legends is a kick!! It is a compilation of "sea stories" that were told to me over many years...often directly from the men I wrote about in the book. I served as an Aide de Camp to Ray Davis in Vietnam and, for a time, Quantico, Virginia and spent many hours "sitting at the feet" of this great man. His stories of commanding a battalion on Peleliu inspired me to write Last Man Standing, the 1st Marine Regiment on Peleliu...an account of the horrific fight on that God forsaken island in the southwest Pacific. I met Eddie Craig while serving as a battalion commander at the San Diego recruit depot. Craig became a good friend. He was one of the most humble Marines I have ever met...when I told him I would like to write his story, he responded with, "I didn't do anything that any other Marine did." Not every Marine has the opportunity to command a regiment in two major campaigns--Bougainville and Guam--or be the Corps operations officer for Iwo Jima, or command the 1st Marine Brigade in the Pusan Perimeter in Korea. I interviewed Lem Shepherd at his home. When I asked him what the most memorable thing in his forty-two years of Marine service, he responded, "Machine guns at Belleau Wood!" My God, his comment raised the hair on my arms...Belleau Wood is the personification of the Corps. Roy Geiger, one of the first Marine flyers, joined the Corps in 1907 as an enlisted man and, by virtue of his intelligence and leadership, became the only Marine to command a U.S. Army Field Army on Okinawa. His exemplary leadership on Guadalcanal as commander of the Cactus Air Force contributed to holding that critical island. Finally, Bob Barrow brought the Corps through the dark days after the Vietnam War ended. His firm professional leadership contributed to instilling the Corps' sense of itself and its high standards.